New Delhi: Indian farmers, battling adversities on farms and off them, have brought glad tidings for the rest of the nation. Foodgrain production is set to rise to a record 277.5 million tonnes in 2017-18, according to the agriculture ministry. At this level, food production is about 0.9% higher than the 275.1 million tonnes produced in 2016-17, also a record crop year, the second advance estimates of crop production released by the ministry showed on Tuesday. The crop year is from July to June. While higher production of foodgrains and non-food crops like cotton and sugarcane suggest a recovery in agriculture is underway, the record foodgrain production and likely fall in output prices puts the spotlight on the proposed minimum support price (MSP) policy. “The latest estimates are a good news in the sense that it shows farmers haven’t lost hope despite all their problems," said Siraj Hussain, former agriculture secretary and a fellow at the Delhi-based Indian Council for Research on International Economic Relations. “We can only hope that farmers will receive a fair price for their bumper harvest... but the challenge is that the reasons for unremunerative prices—be it due to low global prices or market imperfections—is not fully understood yet." The new MSP policy, assuring 50% returns over cost to farmers, comes into effect in the next crop year beginning July. Data from the agriculture ministry projected production of rice, coarse grains and pulses to rise during the year, that of wheat is likely to drop by 1.4% to 97.1 million tonnes in 2017-18 from 98.5 million tonnes in the previous years. While India’s rice output is estimated to rise to about 111 million tonnes in 2017-18 from 109.7 million tonnes a year earlier, production of pulses is likely at a record 24 million tonnes, up from 23 million tonnes the year before. Among different pulse varieties production of chana (gram) is estimated to rise by a staggering 18% to over 11 million tonnes in 2017-18. The estimates further showed that India’s oilseed production is likely to decline 4.4% to 29.9 million tonnes in 2017-18 from 31.3 million tonnes in the previous year. The fall in oilseeds output is driven by a sharp 13% drop in production of soybean. 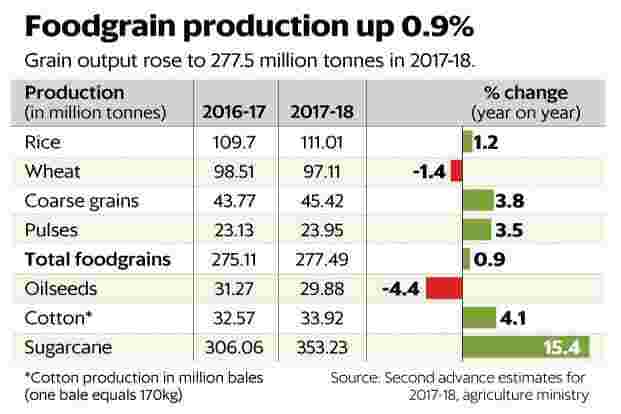 However, the record foodgrain production during the year may not boost India’s farm sector growth rate due to the base effect of 2016-17, which also was a record crop year. The pace of growth is estimated to decline to 2.1% in 2017-18 from 4.9% the year before, the central statistics office said in early January.